Hey kc’ers, thanks for reading this post. This is the latest installment in my keratoconus journey. To recap my graft was in late 2007, I had a rejection episode that was sorted out and I was fitted for a hybrid lens in the grafted eye in 2011. So far so good, but the uncorrected vision in my grafted eye is poor, I can only see with a lens. The prescription is also wildly different to that which is in my ungrafted right eye, which makes life (and balance) difficult, as I need two very different lens. Getting good corrected vision has been a challenge but thanks to Lynn at Collisons Opticians in Worthing (via the NHS) I am OK when I am not having a ‘bad eye day’. When this happens the grafted eye won’t accept the hybrid lens and I cannot see, relying only on the right eye which has an RGP. Long term this is not ideal. I worried about getting older and having age related issues on top of the kc and post graft issues. So you can see the problem I have! Last year my surgeon noted that a cataract had started to form in the grafted eye. A cataract is a clouding of the lens inside the eye which leads to a decrease in vision. It is the most common cause of blindness and is conventionally treated with surgery. Visual loss occurs because opacification of the lens obstructs light from passing and being focused on to the retina at the back of the eye. It is most commonly due to biological aging but there are a wide variety of other causes. At my last appointment this year with Mr M Teimory (left) at Worthing Hospital Eye Clinic, after various tests, he agreed to do a cataract op in the grafted eye- the end results would hopefully be that the vision would be greatly improved and the reliance on complex lens reduced. Cataract surgery is the removal of the natural lens of the eye (also called “crystalline lens”) that has developed an opacification. It is common for post graft eyes to get early onset cataracts, and as it is a simple op I am not too worried, I sort of reckon that I have nothing to lose really as hopefully my vision will be improved. At my pre op appointment I had a variety of interesting tests to ascertain the thickness of my grafted cornea, the corneal curvature and the length and depth of the anterior chamber. They used a Keratometer and a biometer- all very interesting stuff. My surgeon then decides what type and strength of lens he is going to use in the operation. 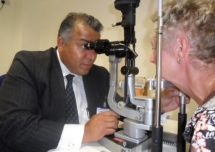 I am also lucky that the op will take place at the new eye surgery unit at St Richard’s Hospital in Chichester. I shall report back after the op and let you know how it goes! ← Why do I donate my Eyes? Surgeon is confident that this op will help! Makes sense and you’re welcome! A confident surgeon is always a good thing. 🙂 KC is just so bizarre. Post-CXL, I have no evidence of it in my better eye now (0% on topography, but mild myopia and astigmatism hung around). I got a lot of improvement in my bad eye, but can’t see for beans and am lens intolerant! Here’s what’s really weird–I can read the eye chart better w/my eye that still looks keratoconic–even if the KC is halted (the one with HIGH astigmatism and moderate myopia). I’m so confused! Lol.